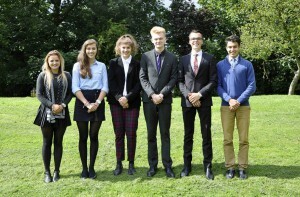 After a rigorous application process, the Head boy and Head girl are appointed together with two Deputy Head boys and girls. The Head Boy and Head Girl, together with their deputies meet regularly with the Head of Sixth Form to discuss any issues that may arise throughout the year. In addition they meet with the Headteacher every term to keep her abreast of student feelings and any areas of concern from a student perspective. In addition, each tutor group elects one student to represent the opinion and views of their fellow tutees. These representatives along with the Head Boy and Head Girl and their deputies form the Sixth Form Management Committee (SMC). The SMC meet at least once per half term after-school to contribute to policymaking decisions, offer an honest critique of the school generally and to organise school events. The committee is chaired by the Head Boy and Head Girl and the minutes of these meetings are circulated to the Leadership group and Headteacher. The school also conducts a review of parent and student opinion by filling in a survey produced by Kirkland Rowell annually. The results are studied in detail and used to target areas for improvement.